It’s been a busy few days as I’ve delivered paintings for two exciting and upcoming Santa Fe art shows. The first is Odes & Offerings, at the Santa Fe Community Gallery at 201 West Marcy Street, with an opening Friday, March 23 from 5 – 7. 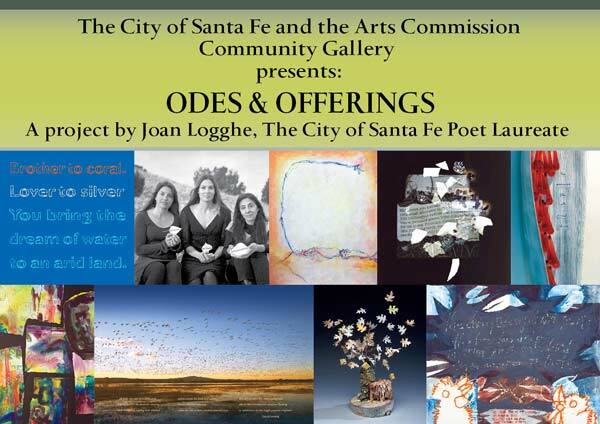 During the exhibition of Joan Logghe’s Poet Laureate exhibit “Odes & Offerings” in the Community Gallery, a series of programs are scheduled to enhance the community’s appreciation of poetry and the written word. This collaborative exhibit asked 36 visual artists to incorporate the words of 36 poets in their work. Participating poets are: Tommy Archuleta, John Brandi, Debbi Brody, Witter Bynner, Lauren Camp, Sudasi Clement, Catherine Ferguson, Phil Geronimo, Jenice Gharib, Natalie Goldberg, Renee Gregorio, Judyth Hill, Michelle Holland, Kathamann, Piper Leigh, Dana Levin, Donald Levering, Jane Lipman, Joan Logghe, Mary McGinnis, James McGrath, Carol Moldow, Mary Morris, Elizabeth Raby, Stella Reed, Barbara Robidoux, Barbara Rockman, Leo Romero, Levi Romero, Miriam Sagan, Lorraine Schechter, Santana Shorty, Henry Shukman, Charles Trumbull, Anne Valley-Fox, and Cynthia West. The exhibit includes work by: Bobbe Besold, Joy Campbell, Dawn Chandler, Peter Chapin, Matthew Chase-Daniel, Dana Chodzko, Bernadette Freeman, Ursula Freer, Charles Greeley, Roger Green, Andrew Keim, Shirley Klinghoffer, Ann Laser, Piper Leigh, Thelma Mathias, Kathleen McCloud, Sabra Moore, Kuzana Ogg, Janet O’Neal, Sallyann Paschall, Gail Rieke, Brenda Roper, Donna Ruff, Jane Shoenfeld, Carol Sky, Michael Stone, Nancy Sutor, Bunny Tobias, Edie Tsong, Blair Vaughn-Gruler, Suzanne Vilmain, Julie Wagner, Cynthia West, Melanie West, Ruth Weston and S.K. Yeatts. 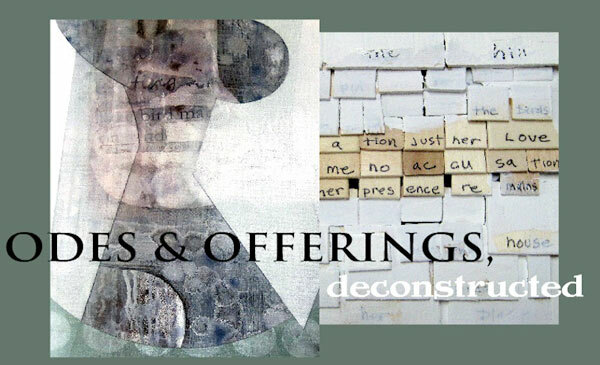 The second exhibition is Odes & Offerings, deconstructed — a sister exhibition to the first, exhibiting art works that grew out of the process of merging poetry with visual art. 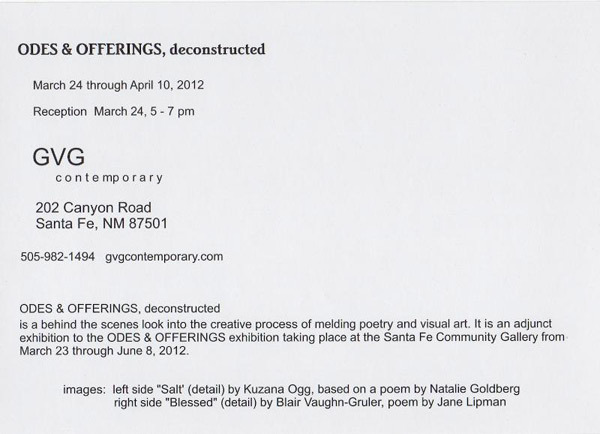 deconstructed will take place at the GVG Contemporary gallery at 202 Canyon Road with an opening Saturday, March 24 from 5 – 7. I am thrilled and honored to have been selected to participate in these events. Check back to see the paintings I’ve created for these two inspiring shows! What an honor for you, Dawn! And well deserved, I might add. I’m really looking forward to the opening, and viewing what will surely be a wide variety of excellent work. And, of course, seeing your wonderful piece! Thanks so much, Karen! Indeed, the work in this exhibition should be *very* interesting. I look forward to it and seeing you there!